Mirror Coat from System Three Resins. 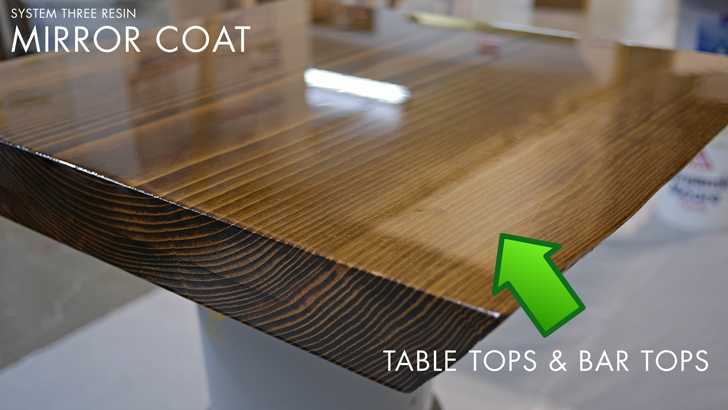 Epoxy Clear Coat for table tops and bar tops. This high performance coating is the cost effective choice for owners and building managers for restaurant and bar counter tops because of the durability and extended life cycle between service visits. Shearer Painting uses The System Three Mirror Coat replacing other coatings previously used by Shearer after field testing and factory consultation with product R&D team at System Three. Such a very beautiful top, I would love to have this in our home not just as table top but also in floor. I’ll ask our Gold Coast handyman about this. Hi there, do you know anyone who does this job in Dallas area?